The above image is a detail from a slab of limestone collected from the Waynesville Formation (Upper Ordovician, Katian) on a class field trip earlier this month to Caesar Creek, Warren County, Ohio. 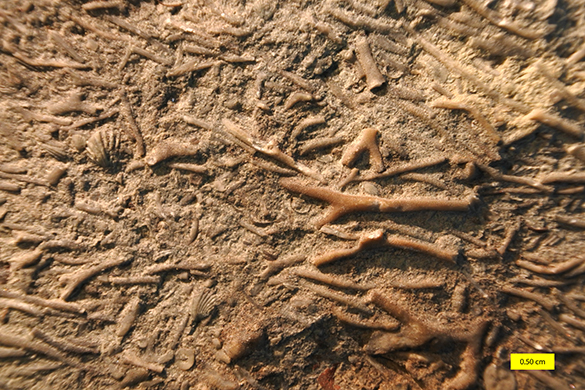 The stick-like fossils are mostly cryptostome bryozoans generally aligned by the last of some ancient water current. Cryptostomes are small and fussy bryozoans, and thus hard to work with. There hasn’t been a significant overview of Ohio Ordovician cryptostomes for quite awhile, so I suspect there is much new to learn about them. The following posts will be from Denver!